Folks move to the country for a lot of different reasons. Fresh air, peace, quiet and room to spread out and do your own thing generally rank quite high on the list. The Holmes County countryside offers all these things in great quantity and the homesteads and weekend cabins sprinkled throughout the hills and hollers attest to that. Folks tend to be good to each other and respectful of the land in these parts—even while “doing their own thing.” Sometimes, however, a landowner may do something that seems perfectly harmless, but can have a lasting detrimental effect on both the land. Take for instance the simple cutting of a trail or access lane. As is the case with most things in life, there’s an easy way and a right way to build a trail and doing it the right way will pay dividends for years to come in terms of reduced maintenance. As with most things, it’s always good to start with a plan. Whether you’re building a tractor lane from one side of the property to the other, cutting an ATV trail through the woods to your deer stand or looping a mountain bike trail the whole way around your property, there are some basic principles to follow that can really improve your odds of ending up with something good and sustainable. The following is a list things considerations for your planning process. As always, please feel free to call our office anytime with questions. We’re always happy to help folks do it right! 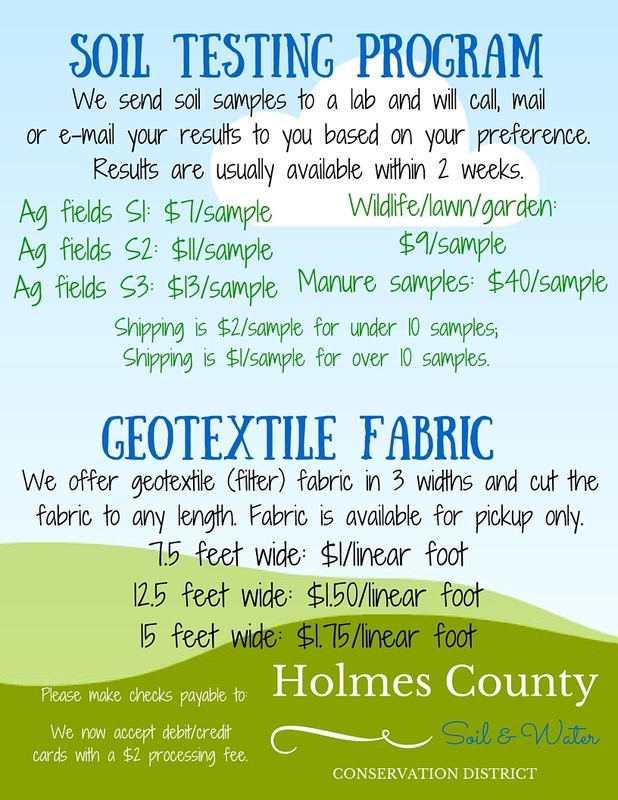 Plan your trail with the help of the wonderful resource of the Holmes County GIS system. It’s available online and you can easily find and zoom-in on your property adding contour lines and even measuring distances. You can even draw on and print out a map to carry into the woods. In every consideration, keep in mind the idea that gravity will work day and night to undo your trail, whether by erosion as water flows down or across the trail, or by rolling debris from above onto your trail. Plan routes run parallel to the contour lines (found on the GIS system mentioned above). When you must go up and down, do so gradually and be careful not to create stretches that gather large amounts of rainwater together. The focused force of water will destroy a trail in no time! Do your best to stay away from damp or wet areas. Lowlands near streams are typically very difficult places to sustain a trail. If you must cross a stream, consider a bridge or an armored crossing that maintains the bottom contour of the stream and allows flow, but won’t be damaged by your passing. Scout your property for the optimum trail location after a rain. This can quickly help you identify potential problems. It may look fun, but nothing is worse for a trail than a mudhole. Proper planning can help you avoid the development of such features, but when one does appear, take measures—often as simple as cutting a shallow gutter away from the hole, armoring the bottom with large stones, or both—as quickly as possible to stop the mud. I know that braking is often a necessary tool for survival, but few things do more to beat up an established trail than skidding to slow or stop. Give yourself time and distance to slow gradually before turns or other features. Extended periods of rain or frequent freeze and thaw conditions can place even the most well-constructed trail into peril. Do you best to stay off when the conditions are rough. Newer PostThere's a New Program in Town: Credits 4 Conservation!